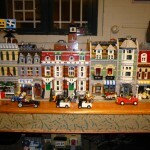 In the two months between graduating from Vermont College with my Masters in Fine Arts and my departure for Portugal, I created four chapters of a graphic novel set in the town I built from the Lego modular buildings, Little Brick Township. 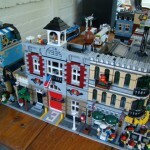 I have collected these sets since their debut in 2007 and now have the Cafe Corner, the Green Market, Market Street, the Fire Brigade, the Grand Emporium, two of the Pet Shop set (to evoke a block of identical townhouses), and the Town Hall. 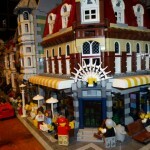 These are some pictures of Little Brick Township as it currently stands. 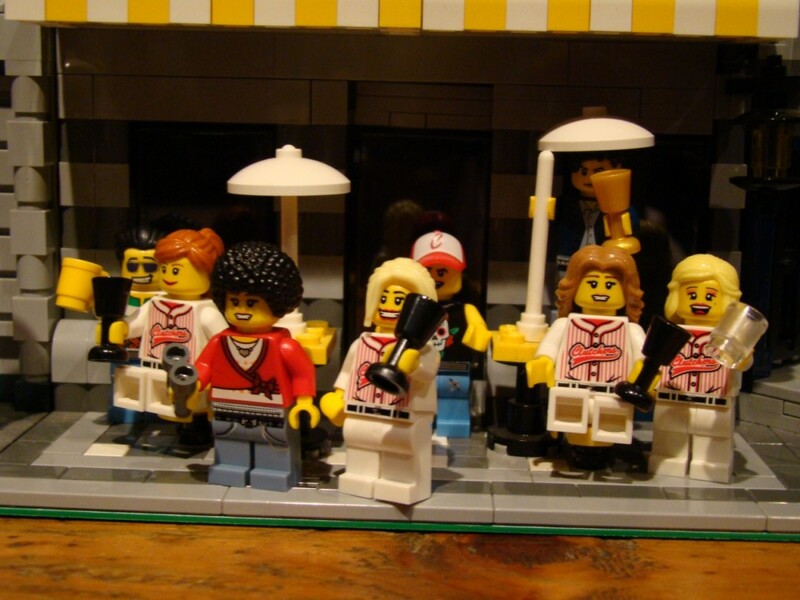 My graphic novel follows eight characters who come together through their participation on a women’s softball team from the Little Brick Township suburbs, not unlike a team for which I played when I lived in New Haven, Connecticut when I was in graduate school. Except that my team wasn’t very good, and this team won the championship. However, a variety of crises have threatened this team’s ability to reunite for the following season. These are the players and significant others, who were photographed partying all night at the Cafe Corner after winning the championship. From left to right: Elvis, his girlfriend Fiona, Ife, her girlfriend Annelise, Nate, his girlfriend Lindsay, Patricio, and his girlfriend Karlijn. Well, it turns out that the mayor of Little Brick Township, Mayor Slik, is not the most honest of public officials, and the fix is in to build a Palace Cinema on undeveloped land on the outskirts of the town. 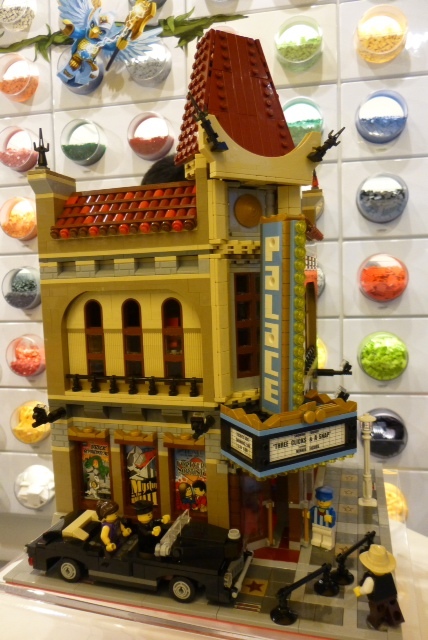 The Palace Cinema is slated to anchor the new Red Light District. Note that this instance of government corruption has taken place in Town Hall under cover of night. 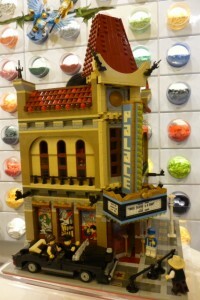 While the Palace Cinema is not on sale to the general public until March 1, members of the Lego VIP Club received early access on Valentine’s Day. Hmmm. About that Red Light District… So on my way to New York City, I stopped by Garden State Plaza in Paramus, New Jersey to pick mine up. Here’s what it looks like, from the store’s display. 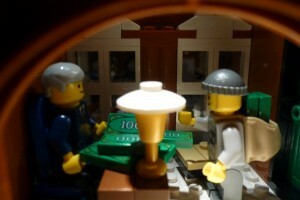 By the way, many of my Lego scenarios have been inspired by historical settings. The early twentieth century design of this modular building evokes a period in history in which theaters were seen as hotbeds of decadence and corruption. In many cities, these buildings were exiled to the outskirts, far from “respectable” society, though people (mostly men) from all walks of life encountered each other in these marginal areas as they sought out various forms of entertainment. When my family and I traveled to Barcelona at the end of December, we saw an exhibit at the Centre de Cultura Contemporanea de Barcelona on that city’s incarnation of the Red Light District, the Avinguda Paral-lel. 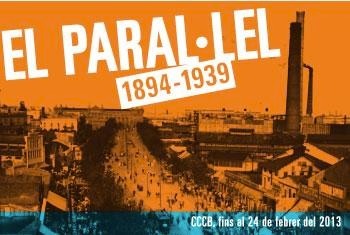 By the way, you have nine more days to get to Barcelona for this excellent exhibit that focuses on a little-known aspect of the city’s history. 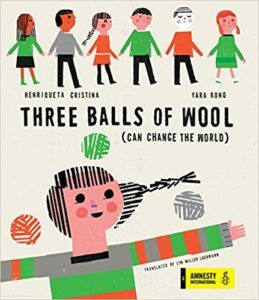 If you miss it, you can learn more online at the CCCB’s site. And no matter what, there’s no shortage of drama and intrigue in Little Brick Township.